Named after the area's longtime Congressman, the multimodal transit center offers convenient links to local shopping, the Henry Ford Museum and the University of Michigan-Dearborn. Amtrak service to the new John D. Dingell Transit Center in Dearborn’s West Downtown area began on December 10, 2014. The facility replaced a smaller, standardized Amtrak depot built in 1979 and located about two miles east. The transit center is within easy walking distance of shops, restaurants and businesses along Michigan Avenue, as well as the Henry Ford Museum and Greenfield Village. The University of Michigan-Dearborn and Henry Ford Community College are also nearby and connect to the site via the Rouge River Gateway Greenway. In addition to Amtrak Wolverine trains, the center is served by Suburban Mobility Authority for Regional Transportation (SMART), Detroit Department of Transportation and intercity buses. Dearborn is one of the busiest Amtrak stations in the state of Michigan. In the early 2000s, the city and its partners including the Henry Ford, University of Michigan-Dearborn, Ford Land and the Michigan Department of Transportation began planning for a new multimodal facility to meet growing ridership, promote economic development and better connect visitors to area attractions. The partners gathered at the historic Smith’s Creek depot at Greenfield Village in 2012 for a ceremonial groundbreaking. 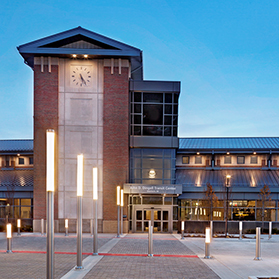 Designed by local firm Neumann/Smith, the 16,000 square foot transit center draws on historic railroad architecture, combining traditional red brick with large expanses of glass. As passengers approach, they are greeted by a clock tower with gabled roof. A glass enclosed passenger bridge connects the building with the south platform. The axis of the bridge is aligned with the clock tower of the Henry Ford Museum, an appropriate design move since the station includes a new entrance to the popular cultural institution. The two-story waiting room includes tall round-arched windows, as well as square windows below the roof line. Altogether, they allow ample natural light to bathe the interior throughout the day. Interior walls are composed of smooth cream colored concrete masonry units accented by rough textured horizontal bands; terrazzo floors are elegant yet durable. Passengers can take advantage of complimentary Wi-Fi and there is also an onsite restaurant. Displays throughout the building are maintained by the Henry Ford, Pure Michigan and other local attractions. Public art includes a mosaic entitled “Transitions” that was designed and crafted by Dearborn high school students. Through the selection and use of environmentally friendly materials and design solutions, the John D. Dingell Transit Center achieved a Leadership in Energy and Environmental Design (LEED) Silver certification. Sustainable features include a metal roof with solar collectors, energy-efficient lighting and geothermal heating and cooling. The station is named for former Congressman John D. Dingell, who represented Southeast Michigan in the U.S. House of Representatives from 1955 until 2015 and is the longest serving member of that legislative body to date. Project funding came through a $28.2 million High Speed and Intercity Passenger Rail grant from the Federal Railroad Administration. The facility is designed to accommodate a proposed commuter rail service between Ann Arbor and Detroit and future high-speed service. City leaders also view the station as a potential anchor for mixed-use, transit-oriented development on the eastern end of West Downtown, thereby forming a new gateway to the community. Long inhabited by indigenous peoples mostly belonging to the Algonquian-language family, the Dearborn area was not permanently settled by European-Americans until the late 18th century. The town was officially founded in 1836 and named after General Henry Dearborn who saw action in both the Revolutionary War and the War of 1812. Dearborn wintered at Valley Forge and was present at the Battle of Yorktown in 1781 when British General Cornwallis surrendered to General George Washington, thus ending the Revolutionary War. Dearborn was also an early member of Congress and was appointed by President Thomas Jefferson to serve as Secretary of War in 1801. In that role, he helped plan for the removal of American Indians to the territory beyond the Mississippi River. Towards the end of his time in public service, Dearborn served as Minister Plenipotentiary to Portugal. Dearborn, Mich., is but one of numerous towns and counties named for him. Located ten miles west of Detroit, by the 1830s Dearborn was an important stage coach stop on a national highway connecting that city with Chicago. Due to this early transportation role, Dearborn was soon linked to its larger neighbor via the Michigan Central Railroad (MC). The MC had its origins in the Detroit and St. Joseph Railway, one of the first established in Michigan under an 1832 charter. The MC took over the line in 1846, paying the state $2 million for the 143 mile right-of-way stretching from Detroit to Kalamazoo. Twenty years later, MC was subsumed into Cornelius Vanderbilt’s powerful New York Central Railroad. Dearborn became the first stop west of Detroit, and in 1898 the town received a new station meant to assert the power and influence of the MC. The one-story building was constructed of wood in the Queen Anne style, making use of architectural features such as towers, fancy woodwork, gables and prominent chimneys incorporating elaborate brickwork. The Dearborn depot was marked by a distinctive two story tower topped with a conical roof and pinnacle. This tower projected from the façade so that the ticket agent could have a clear view of the tracks in order to monitor train movements and properly advise passengers of a train’s arrival. The waiting room was marked by a prominent gable with a piece of decorative bargeboard located at the peak’s interior; the gable also highlighted a set of recessed windows. The varying roofline was covered in wood shingles, further adding to the structure’s picturesque massing. A deep eave supported by simple, curved brackets ran the length of the track-facing façade, providing passengers with protection from the beating sun and inclement weather. Dearborn is probably best known as the hometown of Henry Ford and is the headquarters of the Ford Motor Company. Visitors are drawn to the nearby Henry Ford Museum and Greenfield Village complex. The museum holds a diverse array of objects that represent a wide spectrum of American history and experiences. Greenfield Village in an extensive 90 acre indoor-outdoor museum that showcases dozens of historic buildings moved to the property from their original locations and arranged in a “village” setting. It was envisioned as a novel approach to learning in which visitors could experience American history through its built environment. Buildings from the 17th century through the 20th century are “inhabited” by costumed interpreters who give visitors an idea of the continuity and change in American life over 400 years. They include the Connecticut home of famed spelling reformer and author Noah Webster and the Illinois courthouse where Abraham Lincoln practiced law in his early career. Rail enthusiasts are drawn to the village because it employs a steam locomotive to move people throughout the site. Popular attractions include the late 19th century Detroit, Toledo and Milwaukee Railroad roundhouse as well as the Smith’s Creek depot that once stood in a village south of Port Huron, Mich. The handsome red brick station with Italianate influences dates to 1858 and served the Chicago, Detroit and Canada Grand Trunk Junction Railroad before it came under the auspices of the Grand Trunk Western Railroad in 1928. Today the depot is one of the few remaining pre-Civil War stations left in the country. Ford wanted the depot for his museum because of its associations with a young Thomas Edison, and he had it moved in 1929. Groups visiting the Henry Ford Museum complex can make special arrangements with Amtrak to be dropped off near the depot. Tours of the Ford River Rouge Complex can also be set up at the Henry Ford Museum. Constructed from 1917-1928, when completed it was the largest integrated factory in the world and helped make Detroit a powerhouse in the automobile industry. The comprehensive facilities could manufacture steel, glass, tires, radiators and other materials and parts needed for automobile assembly. From its production lines came boats, Model A’s, tractors, parts for the Model T, the Ford Thunderbird and Mustangs. In the 1930s, more than 100,000 laborers worked in and among its 93 buildings which included ground-breaking factory structures designed by Albert Kahn; large expanses of glass at the roof level allowed natural light to stream into the buildings, a far cry from the typical crowded and dirty industrial buildings that dotted the nation’s urban fabric. Continuing in this spirit of innovation, starting in the early 2000s, many buildings at River Rouge were retrofitted with environmentally friendly features such as green roofs. Due to their contributions to American life and culture, the Henry Ford Museum, Greenfield Village and the Ford River Rouge complex are listed on the National Register of Historic Places. Due to the economic opportunities created by the Ford River Rouge plant, Dearborn was a magnet for immigrants as well as Americans from other regions. The population remains diverse; in fact, Dearborn has a sizable Arab-American population including a large and established Lebanese community. The Islamic Center of America boasts the largest mosque in North America, completed in 2005. The town also hosts a large Armenian-American community established in the early 20th century. Amtrak provides ticketing and baggage assistance at Dearborn, which is served by six daily trains. The Wolverine Service is financed primarily through funds made available by the Michigan State Department of Transportation. Baggage assistance provided by Station Staff.Carry on bags only.Plz note carry on limits.